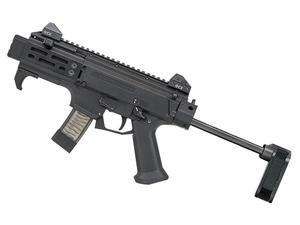 The Scorpion EVO Micro features a compact 4" barrel, HB Industries handguard and was the result of CZ's development of a smaller Scorpion for a undercover drug interdiction unit. This model features a NoOsprey faux suppressor made by SilencerCo and uses an telescoping brace from SB Tactical for additional stabilization. The muzzle will accept 1/2x28 or 18x1 threaded muzzle devices. Low profile sights with 4 aperture sizes allow for easy sight acquisition in close quarters. * Magazine(s) are not included for Restricted States. Not for sale in California, Click here for details.